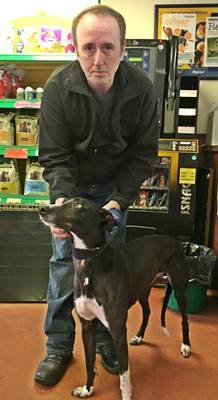 We would like to say a massive thank you to Greyhound Gap for taking on this girl. Delilah came to us originally as a stray through the Bolton Dog Wardens on 11/4/16 she was adopted from ourselves but unfortunately yesterday she had to be returned to us due a behavioural problem. So we’ve got in touch with Lisa of Greyhound Gap who has kindly offered to take Delilah on. Michael from Greyhound Gap collecting Delilah from ourselves. We will look forward to staying in touch with Lisa and co to see Delilahs progress. Once again a massive thank you to Greyhound Gap! This entry was posted in Uncategorised on 15th July 2016 by admin.